Today at Lucky Dog Books in the D I picked up a big hardback encyclopedia of Roman history for a cool $6, plus some old Who's Who In The DC Universe reader copies, a couple of Steely Dan albums, and this heavy metal sampler LP called Heavy Metal Thunder. Originally released on French label/distro Carrere in '82, the one I picked up has label and album print (except for title and band names) in Spanish, and it was released on Peerless in 1983. Neat stuff. Among the 45s I picked up was this pop obscurity. 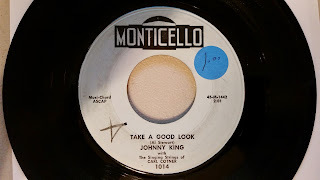 Take A Good Look b/w Close To You by Johnny King, with The Singing Strings of Carl Cotner, released on a label called Monticello in 1960. I couldn't find out anything about Monticello via a Google search. This site puts the recording year of this seven inch at 1960. And the song was mentioned in a Billboard in mid-January, 1960, though I see a couple of other links that have it for sale put the year of its creation at 1959. There's a few copies available on Ebay. Take A Good Look was written by one Al Stewart, but I don't think it was the Year of the Cat Al Stewart because he woulda been 13 and 14 in '59-60. My Google search turned up nada on the song. I prefer this track to the B side, Close To You. Close to You was written in 1943 by Jerry Livingston, Carl Lampl and Al Hoffman, and has been covered three times by Frank Sinatra. And I guess once by Johnny King with The Singing Strings of Carl Cotner. Two of the three writers mentioned above - Hoffman and Livingston plus a guy named Milton Drake, wrote Mairzy Doats. My pet peeve is the words "can't you see" in a song. So cliche, and Close to You features it, but it's still okay I guess. I couldn't find a dang thing about Johnny King. At least, no one named Johnny King who I think was the singer on these tracks. 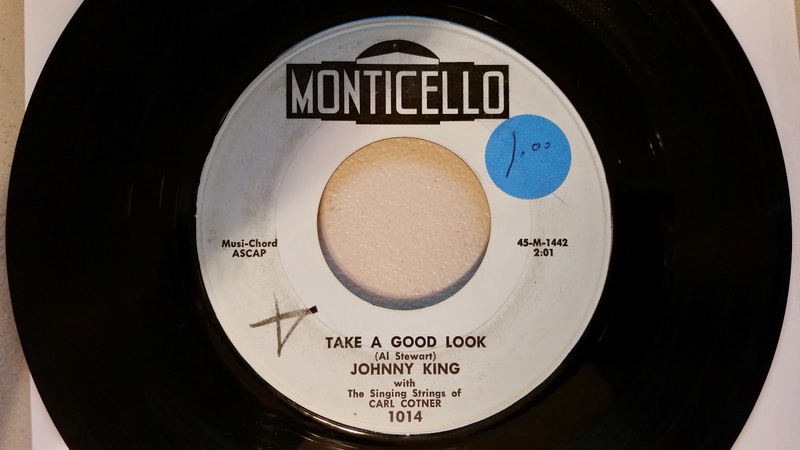 Carl Cotner, who led the backing band on both sides of the vinyl, is more of a known entity than the shadowy Johnny King. Per Cotner's Discogs page, he was "Gene Autry`s longtime music director and movie stand-in," born in 1916 and passed on in '86. So who listened to this stuff back in 1960? Was it for teens? The elderly? Babies? Thirtysomethings? I really don't know.